Let your doggy be a bright star in our premium white collar for a dog FDT Artisan! A cool white dog collar is a luxury dog supply combining a careful handmade work and high-quality durable materials. 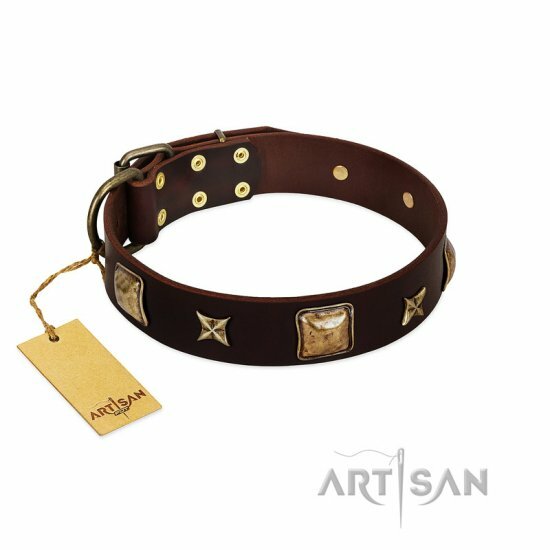 Made of full grain soft leather, a stylish white studded dog collar ensures comfort walking and a prolonged wear. Gorgeous brass squares and stars underline your taste and your doggy’s strong breed. Brass rustproof hardware and a tear-proof leather strap allow serving you for many years. Use a solid D-ring for walking on a dog leash with your four-pawed. A strong traditional buckle allows taking a white leather dog collar with studs on/off in several seconds. A cool white dog collar FDT Artisan is designed for walking, training of powerful medium and big dogs. A white collar for a dog is packed in a brand box, it will not cause damage to a dog collar during shipping. Moreover, it is a great gift idea. Provide your doggy with optimal comfort with a white studded dog collar FDT Artisan from the producer directly! Appealing design with squares and decorative brass stars add vintage look to a leather dog collar.